If you use BigCommerce we offer a native app that will enable you to sell subscriptions, payment plans, wholesale programs and much more on the BigCommerce platform. You can read more about the PayWhirl + BigCommerce integration in the BigCommerce app store. In your BigCommerce account click "Apps" in the main menu. 2) Locate the BigCommerce Recurring Payments & Invoicing by PayWhirl App in the app marketplace by doing a quick search for paywhirl. 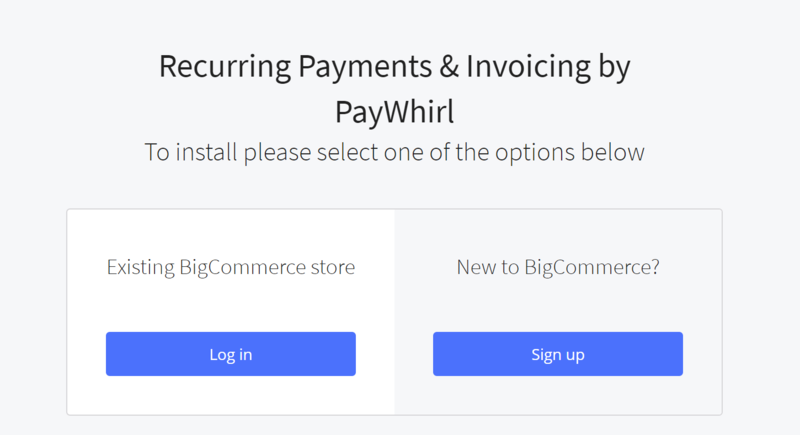 3) Click "Install" on the PayWhirl / BigCommerce app listing page. 4) Next, review & grant PayWhirl permission to access your BigCommerce account by clicking the "confirm" button. Once the app is installed it will appear under the active Integrations section of your PayWhirl account. Optionally, you can click the "settings" button to give your integration a name (only displayed to you) once it's installed. Note: You can also install the app from the PayWhirl Apps and Integrations page. Login to the BigCommerce Account you want to connect. Once installed, you will see a new "BigCommerce settings" section appear at the bottom of your plan settings, when you edit a plan in your PayWhirl account... This allows you to control how orders are placed in BigCommerce and determine what customer group (if any) are assigned to people with the plan. For example, if a plan was for a "normal" subscription where you ship something monthly, you would most likely want to leave it on "Place orders on ALL successful payments." However, if this plan was for a layaway program you might want the "Place orders only on the LAST successful payment" option. Once you have created your plan(s) in PayWhirl you can test the integration using the PayWhirl Test Gateway (which is installed by default in your account). You can test and simulate everything in the PayWhirl system using our test gateway before going live. On PayWhirl you have the option to create customers in the backend (as an admin) and subscribe people to plans in your account... OR... You can install a payment widget into a page on your website so customers can select and purchase subscriptions automatically. Either way, after you run a test charge you will will see a product, customer and order in your BigCommerce account (assuming you have BigCommerce orders enabled in your test plan settings). If you would like to test your widget(s) without installing / embedding them into your website you can use the "Full-Width Preview" button inside your widget settings (top right corner) to launch your widget into it's own page as a preview. Once your widget is in preview mode you can test a checkout just as a customer would using the PayWhirl Test Gateway. Note: Please make sure you are logged out (as a customer) before each test checkout on the preview page. For example, here is an example of a customer checkout in a widget preview... This is what your customers will see after they select a plan and checkout in one of PayWhirl's embedded payment widgets. 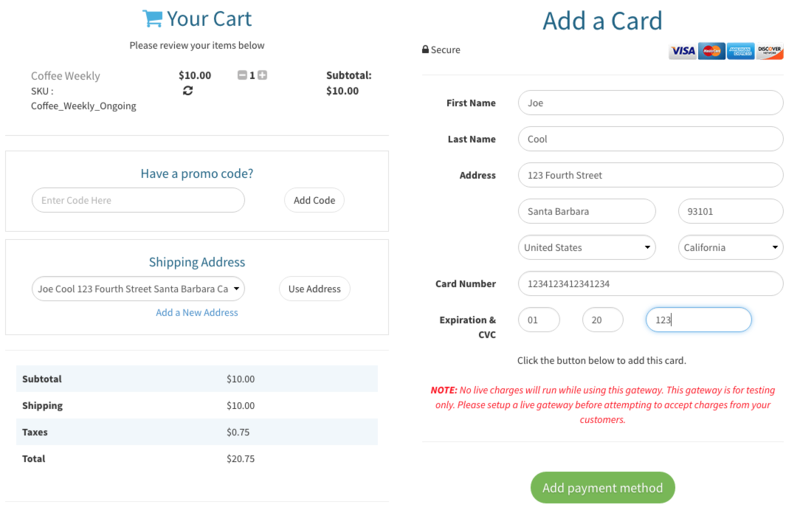 Once you have generated a test purchase you will see a CUSTOMER appear in your BigCommerce account. Finally, if you can see any ORDER that are generated by your PayWhirl customers with all of their invoice details, shipping information and customer profile questions / answers (in the staff notes section). If you have any questions about BigCommerce or the PayWhirl BigCommerce app please let us know.